Paul Paterson, Durham’s Provincial Grand Master, Master Norman Eric Heaviside, Robin Middleton, Bishop of Durham Paul Butler, Dr Norman Taylor, John Watts Durham Benevolence Chairman and the Venerable Stuart Bain. A team can now cook up a storm thanks to a kitchen refit which will ensure people will not go hungry at Sunderland Minster. Freemasons in Sunderland heard about the work done by the church during school holidays to keep children entertained, but were struggling to make up to 160 meals due to a lack of facilities. Hot plates, boilers, kettles and flasks were being used, with some dishes prepared overnight and taken in, while the cafe at the venue was not suitable to use for cooking for the group. Members of the Durham Benevolence, the charitable arm of the Province of Durham Freemasons, which covers Sunderland, heard about the difficulties and decided to tap into its funds to help. 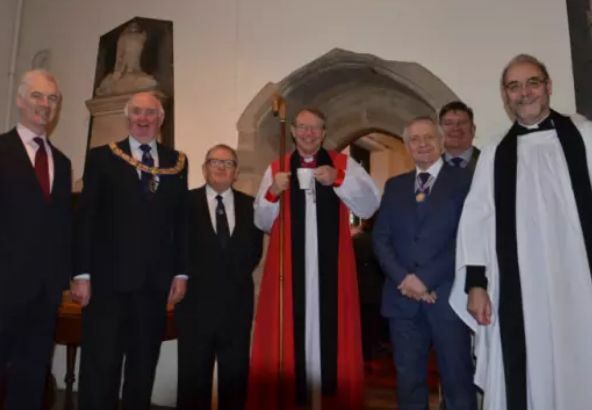 It gifted £25,800 to help fund the initial design and building costs for the revamped Vestry Servery to include ovens and other kit, with the age of the building posing extra difficulties.